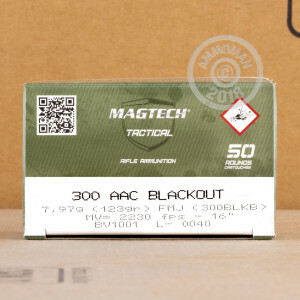 These Magtech First Defense rounds are a high quality option for your 300 Blackout rifle. 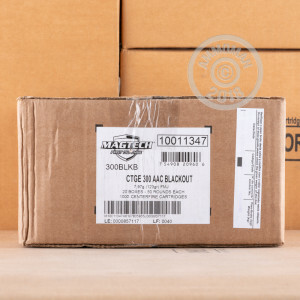 Each round in this case of 500 is loaded into boxer primed, new brass cases that are re-loadable and house a 123 grain Full Metal Jacket projectile. Magtech's First Defense line of ammunition aims to deliver the consistency and reliability that we have come to expect from personal defense ammo. 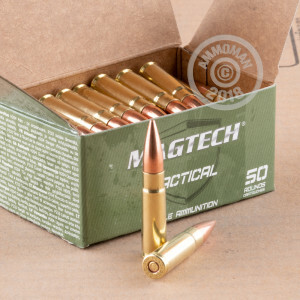 Magtech was established in 1990 as the commercial brand name of the ammunition manufacturer CBC. Their ammo is produced in Brazil and exported all over the world. The CBC Group is made of four major companies, Magtech, CBC, MEN and Sellier & Bellot who all produce quality, small arms munitions. Want free shipping? At AmmoMan.com all orders over $99 qualify for fast and free shipping! Bought this as an alternative to hand Loading a large amount of 300BLK, as I have not been able to find a reliable source for 110-125gr .308" FMJ bullets. Quite accurate, have gone through about half, zero issues. Brass is good for reloading, also saving me time from converting .223, or paying as much per round for this ammo for just brass!